Picturesque, pastoral scenery and rolling farmland may epitomise Ohio, but this Midwest state also dishes up buzzing cities, terrific cultural attractions, and plenty of opportunities for outdoor adventure. Beyond the farms, undulating hills and leafy dales abound. Along the eastern border, the foothills of the Appalachian Mountains lure adventurous travellers, who find hiking, fishing, and boating in such local beauty spots as Shawnee State Park. Columbus, Ohio’s largest city and state capital, is home to one of the USA’s biggest college campuses, Ohio State University, which lends the city a hip, youthful vibe. It also hosts the Ohio State Fair agricultural extravaganza and is home to the historic German Village, where visitors can snack on bratwurst or cherry strudel and visit Schiller Park, where open-air Shakespeare performances take place throughout the summer. Stock up on organic produce and locally roasted coffee at North Market, which has been welcoming hungry Ohioans since 1876, or visit the Short North Arts District, home to chic art galleries and edgy boutiques. 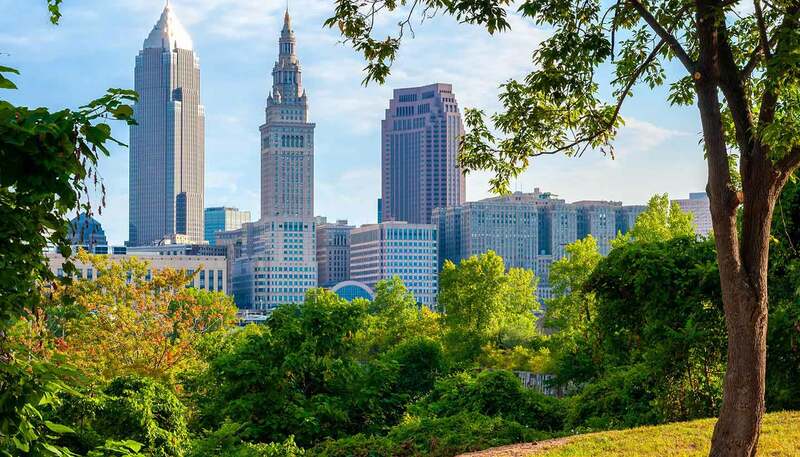 Cleveland, the state’s second largest city, sits on the shore of Lake Erie, tucked among northern Ohio’s rugged river valleys and steep, forested hills. Stop by Cleveland Lakefront State Park to lounge by the water or visit one of the six lighthouses scattered around the lake. Also overlooking the lake is The Rock and Roll Hall of Fame, a venerable museum that honours music’s greats such Elvis Presley, The Beatles, and Bob Dylan. Alternatively, dose up on culture in Cincinnati. The striking Zaha Hadid-designed Contemporary Arts Center shows an innovative, ever-changing programme of exhibitions. And the excellent craft breweries mean a good night out is guaranteed. 116,096 sq km (44,825 sq miles).